I was really drawn to Elsie's story and was much more invested in her life in Germany. From the beginning of the book, I was struck by McCoy's original take on World War II. Not often do we find our protagonist on the side of "the bad guy." While Elsie's opinions certainly grow and change throughout the book and the Nazi's are clearly in the wrong, McCoy does an excellent job of illustrating, both in the Elsie's story and in Riki's, that things are more often grey than black and white. 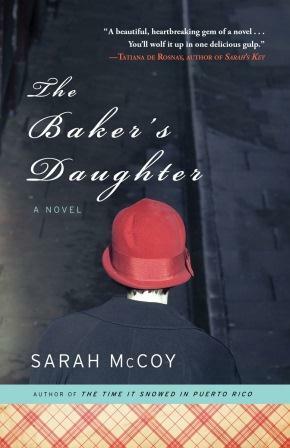 Alternating chapters between the past and present, McCoy draws her readers through The Baker's Daughter, although for me it was much more to get to Elsie and the tension that just did not let up. Writers often put their characters into dangerous situations only to pull them back just in time. McCoy offers a much more realistic approach. Like most Germans, the Schmidt's suffer, with very different resulting opinions about what has happened to them. McCoy contrasts the Nazi's treatment of Jews with the United State's treatment of illegal immigrants through Riki's part of the story. It's an interesting comparison, although it got lost somewhat with so many plot lines involved. McCoy has tried to cover a lot of ground here and I would have preferred to focus more on Reba's family and how that affected her relationships. Would I recommend this book? Absolutely, it is a lovely book about women who must find their inner strength under very different but very difficult circumstances. It would make terrific book club selection with much to discuss. McCoy has written a book that is thought provoking on many levels. "We all tell little lies about ourselves, our pasts, our presents. We think some of them are minuscule, unimportant, and others, large and incriminating. But they are the same. Only God has enough of the story to judge our souls." Thanks to TLC Book Tours for including me in this tour. For other opinions about this book, check out the full tour. This is Sarah McCoy's second novel. To learn more about McCoy and her writing, visit her website, her blog, or her Facebook page, or chat with her on Twitter. My how being an author has changed in the past ten years - can you imagine trying to find the time to write, tour to promote your work, have a family and keep up all of this internet presence? Fortunately, McCoy seems to have figured it out; she is currently working on her third novel. I have this book and plan to read it sometime, but for some reason, I don't feel like reading any books which take place in the midst of war lately. I was happy to read your thoughts on this one. I loved this book and thought she really made me think about the grey areas....wonderful review, Lisa! I really liked this one too, Elsie was a wonderful character to read about. Sounds interesting, I don't know if I'll buy the comparison between Nazi Germany's treatment of Jews and America's treatment of illegal immigrants though. 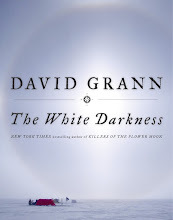 This is a book that I want to recommend to my bookclub, and will do so when it's my turn. I have heard so many good things about it, and when I get the chance I will be reading it too. Great review today. I liked what you had to say about it! I am glad you enjoyed this one, Lisa! I agree, it makes such a good discussion book. So glad you enjoyed it. It's one of my favorites for this year. I can see how this would be a great book club book - thanks for the recommendation, and for being part of the tour.